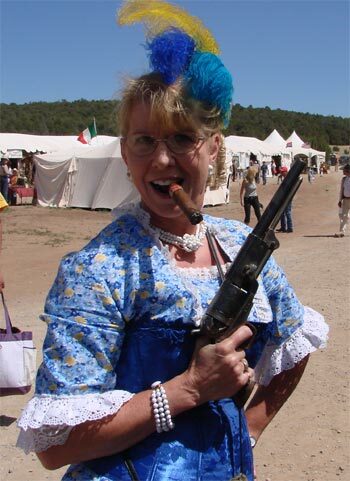 Probably not the best impersonator of Josy Wales, but definitely the prettiest. This is from our picture archive from the 2008 End of Trail in July. The NRA museum had a booth at Vendor’s Row, showing a small portion of the guns from their new exhibit – GUNS WEST! Movie guns used by Clint Eastwood, Chuck Connors, John Wayne and Tom Selleck were among the guns on the table and thanks to Phil Schreier, we got a chance to actually “touch” the guns. Hopefully Phil was able to clean off all the DNA that we left on them. Our new Cowboy host also had a chance to “try out” the guns and talk with Phil all caught on video which will show up on our site soon. GUNS WEST! will be on exhibit in the William B. Ruger Gallery of the National Firearms Museum in Fairfax, Virginia, until January 1, 2009. 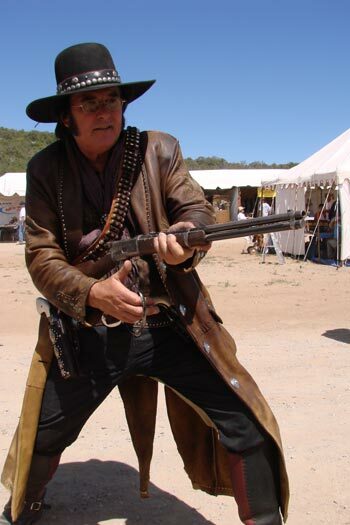 We are also planning on presenting many of the guns from this exhibit in the 2009 season of Cowboys. Left: Marshal’ette with one of the Walker Colts used in the movie The Outlaw Josey Wales. Tupelo Flash with one of John Wayne’s big loop 92’s. 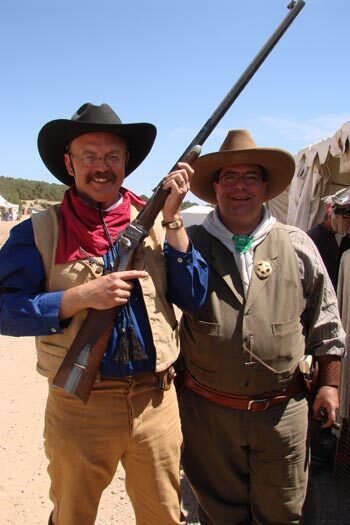 Curator of National Firearms Museum Phil Schreier is making sure I don’t take off to shoot a bucket at 500 yards with this Sharps rifle used in the movie “Quigley Down Under”.